As anyone who has ever served at Streets of Hope knows, the rain can present special challenges for feeding the homeless. In downtown San Diego, the homeless often move away from their normal dwelling spots to avoid the rain and those who have tents are reluctant to open up and risk getting their sleeping quarters wet and soggy. So, when trying feed and clothe the homeless, situations like these necessitate a change in strategy. Its moments like these that highlight what Streets of Hope San Diego is all about. This past Monday, volunteers changed up the normal pattern of walking the streets and instead opted to get into separate cars to find the homeless who were avoiding the rain. One such rainy day dwelling for the homeless is found in the B Street, 92101 tunnel, by San Diego City College. 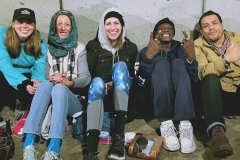 One group of volunteers, familiar with this spot consisted of Anne, Jen, Zo, and Nathan who found a group of about 10-15 homeless people congregated there. As the volunteers rolled up with a car full of food, water, and clothing, they each grabbed a full load and began passing out the items. This is where they met one special homeless couple by the names of Wendy and Ben. Immediately upon approach Wendy and Ben greeted the volunteers with smiles and were more than happy to share their stories. During the time spent with them, they were given several clothing donations including pants, shirts, hoodies, and sweaters which often come in handy during these cold nights. They and the rest of the homeless people in the tunnel were given food and water, clothes and offered prayers. As the volunteers were getting ready to leave something special happened. Wendy courageously asked each one of the four volunteers to pray for her. And as Zo finished up the final prayer, Ben jumped in and started praying for the volunteers, providing a moment of encouragement for everyone involved. Its moments like these that highlight what Streets of Hope San Diego is all about – building relationships with the homeless.